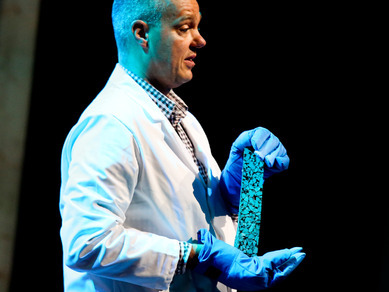 Self Healing Asphalt could double the life of asphalt. March 15, 2013 - Engineering professor Erik Schlangen, of Delft University of Technology, may have found a way to double the expected lifespan of asphalt. He did this by inventing a "self-healing" asphalt material. Asphalt is used for many roads becuase of its noise reduction and water drainage capabilities, but begins to show signs of wear after a few years. Click on the link below to watch the video of Schlangen using heat induction (in this case a microwave) to mend a 2 broken pieces of asphalt together into 1. It is also claimed that the new "healed" asphalt is stronger then the original asphalt. The asphalt is infused with pieces of material similar to steel wool. The cost of the new asphalt would go up roughly 25%, but would be worth the investment if it lasts twice as long! Read the article "Self Healing Asphalt" or "Self Healing Roads Under Way"
Season's Greetings from Ben's Asphalt, Inc! The happiest time of the year is finally here, may this holiday season be full of cheer! Thank you for making our success possible! We truly value your loyalty and we wish you a wonderful Holiday Season! As a Property Manager, it is important to be aware of the most current and up-to-date tools and techniques available to properly address your asphalt maintenance needs. and Southern California Firefighters this Friday, December 21st at the Honda Center in Anaheim. We are collecting toys atRockwell's Bakery & Cafe-17853 Santiago Blvd., Villa Park, CA 92861 and Ben's Asphalt, Inc.- 2200 S. Yale Street, Santa Ana, CA 92704. You may also donate by clicking the button below. Ben's Asphalt is a proud supporter of the Cystic Fibrosis Foundation, the world’s leader in the search for a cure for cystic fibrosis. The Cystic Fibrosis Foundation is a nonprofit donor-supported organization committed to fighting CF in every way possible. We encourage you to visit their website to donate and help save the lives of children and young adults in America. Thank you for joining with us in support of a cure for cystic fibrosis! July 27th - Ben's Asphalt is proud to team up with ABC7, Vons, Southern California regional food banks and ESPN LA 710 to help Feed SoCal throughout the month of July. During hard economic times 1 in 6 people in Southern California will go hungry. This is even truer during the summer time. Those hit hardest during these times are children, veterans, and the elderly. Our goal is to fill our truck with '20 Tons of Food' to donate. You can drop off all donations at Rockwell's, located at 17853 Santiago Blvd, Villa Park. Get a FREE cookie from Rockwell's Bakery with any food donation! Food banks need your help and contributions, no matter how small. July 27th - It's that time of year again, time for the Orange County Fair! What else could make a trip to the Orange County Fair Grounds more fun than the annual 'Demolition Derby' fundraiser? Make sure to clear your calendar on Wed Aug 8th and/or Sat Aug 11th at 8PM so you can get Orange County Fair tickets to attend this one of a kind event. Ben's Asphalt is proud to be a supporter of this yearly tradition. Proceeds from the destruction derby will go to help out organizations such as the Boys and Girls club of San Juan Capistrano, Support our Troops, YMCA of Orange County, and Natalies Wish, driving towards a cure for cystinosis. A Thank You from Angel Stadium.